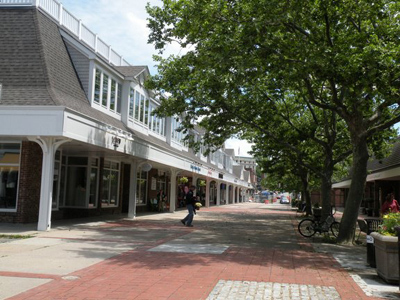 Long Wharf Mall is a great place for Newport Rhode Island shopping. 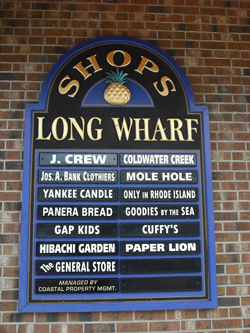 It has a nice variety of clothing stores, gift shops and specialty food stores. It is located opposite Washington Square, between Thames Street and America's Cup Avenue. 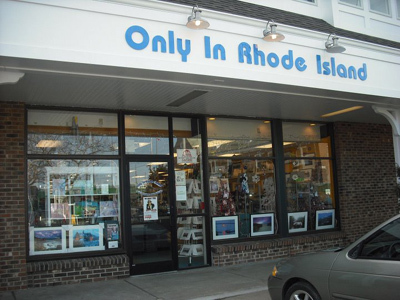 It's a great place to pick up souvenirs and gifts for family and friends who weren't lucky enough to come to Newport with you. As usual, our native advice is to walk if you can. Newport RI is a walking city. If you're driving, you can get validated parking at the lot on the north side of the mall, although the lot may be full during the summer. The entrance is on Marlborough Street (next to the Fire Station and across from Cardine's Field). This area is small enough that you'll be able to walk to and see everything very easily. My two favorite places here are Panera Bread and Only in Rhode Island. Panera Bread is a great place to enjoy a soup, sandwich and dessert. Grab a seat by the window and watch the people walking by on America's Cup Avenue. 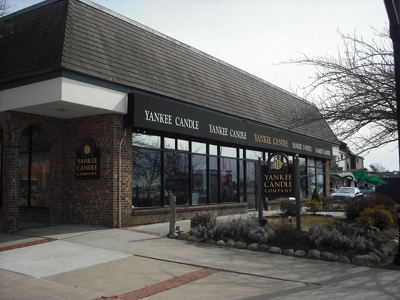 This location used to be the site of the Newport Creamery, which still has a store open on Bellevue Avenue. Many native Newporters have the habit of describing where something is located by mentioning what used to be there. You may find me doing that throughout the site. "Panera Bread, that's where the Newport Creamery used to be." And if you haven't had your fill of shopping yet, Brick Market Place and countless other Thames Street are just a few steps away!